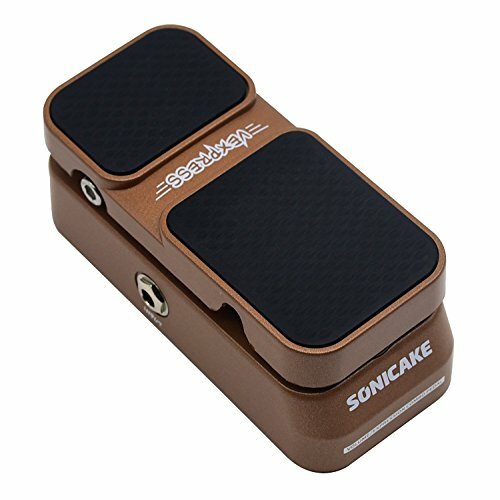 SONICAKE Epression Pedal Vexpress is a passive volume/expression pedal. True analog circuit design combines 2 functions in 1 unit, a passive volume and an expression pedal. Vexpress can automatically detect and grab the output (EXP or VOL) objective. Smooth taper responds to various parameters with maximum precision. Used as a volume pedal, input jack in, output jack out, as usual. Used as an expression pedal, leave the input jack unconnected, and connect the output jack to the device with a stereo 1/4” cable. An extremely compact miniature size saves quite some space on your crowded pedal board. Working without battery or pedal power supply, it can be used in extensive range with guitar, bass and other musical instruments. Automatically detect and grab the output (EXP or VOL) objective. Smooth taper responds to various parameters with maximum precision. Made of hard plastic, lightweight casing, but yet very robust and well-built; Input Impedance(Volume Mode): 100k Ohms; Pot Resistance(Expression Mode): 10k Ohms; Dimensions: 148.5(D)*65.5(W)*61(H)mm; Net Weight: 250g.